Xanthorrhoeaceae is the family of grasstrees with many species spread around much of Australia including the dry centre. Not so many years ago there were a number of other genera included, but these have progressively been allotted to other families, so now Xanthorrhoeaceae has only the Xanthorrhoea genus. 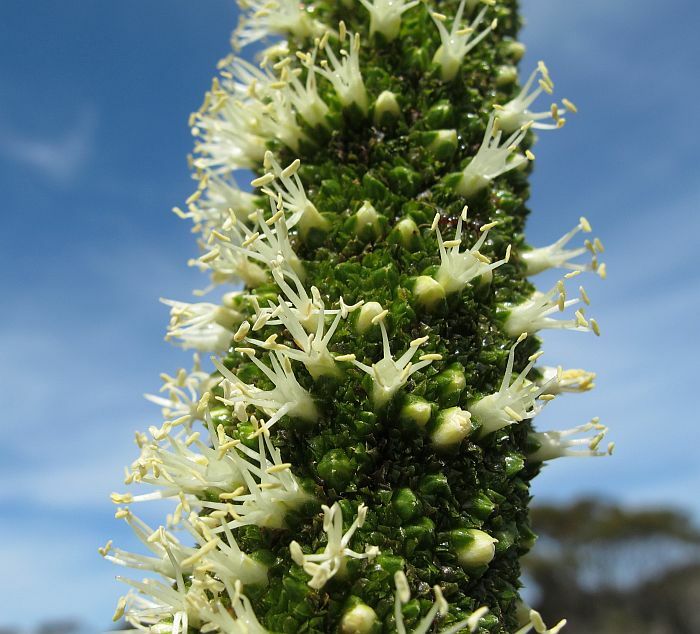 Grasstrees are also known as Blackboys or Yuccas and currently in Western Australia there are 9 described species and another yet to be. However as these plants are very bulky to collect, it takes a very dedicated botanist to gather more than is absolutely necessarily, consequently there are a number of gaps in herbarium collections, including from the Esperance district. 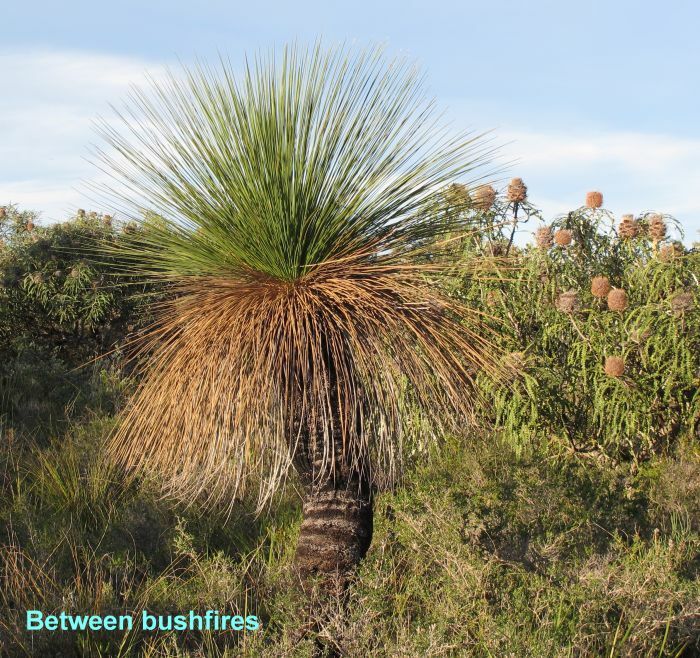 There is only one grasstree recorded for the Esperance region, but another species exists around 90 km (56 miles) west of Esperance, notably along the Munglinup Farmers Road that is more robust and noticeably different in many respects. So it is either a known species a long way from its recorded distribution, or is undescribed. 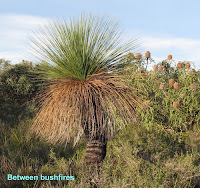 However, apart from that species, Xanthorrhoea platyphylla is common and widespread in coastal and near coastal environments from Israelite Bay to Albany. 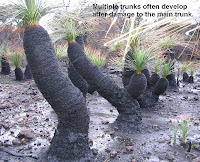 The trunk of Xanthorrhoea platyphylla can reach 3 metres (10’) in height with a single trunk, or with one or more branches. These are made from their leaf bases that pack down to form a thick 5 cm (2”) or more covering of the living pithy centre. This is a slow process and larger plants are probably several hundred years of age. 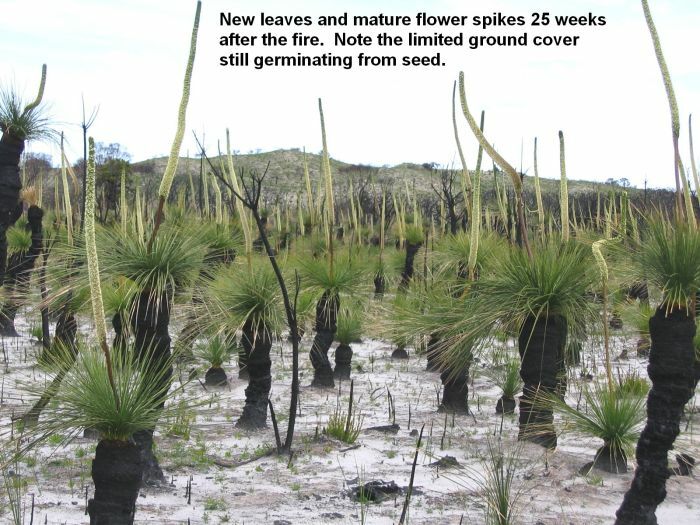 This leaf base compaction rate is highly variable and dependant on the habitat (nutrition and moisture availability), the frequency of bushfires as these encourage considerably more foliage growth compared to those not burnt for many years, so gauging the age of grasstrees by their height is most unreliable. 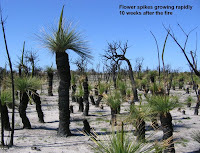 Xanthorrhoea platyphylla prefers growing in a sandy soil, which may be deep, or shallow over granite or gravel. The pH of the sand can be acid or alkaline, although the latter are mainly confined to the hollows between tall-stabilised dunes, whereas with acid soils they will happily grow on the top of sandy hills. They will also grow in low-lying areas subject to temporary flooding, so as can be gathered growth rates vary enormously. 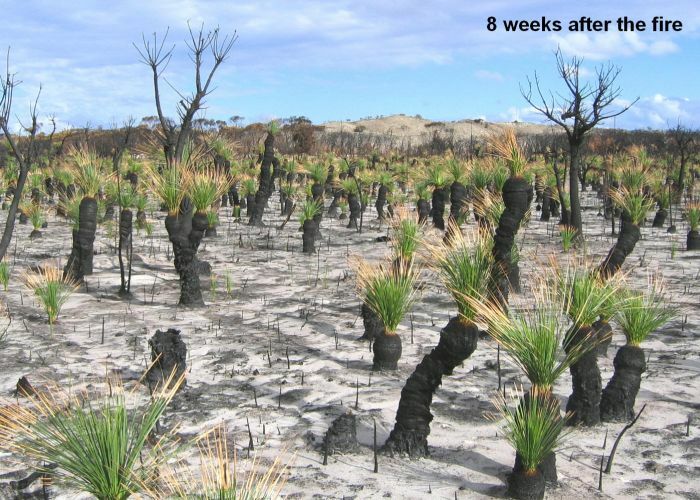 Unfortunately, many grasstrees particularly in the lower areas and where soils are acid, are dying from the effects of dieback (Phytophthora cinnamomi) a disease that rots their roots. In fact the number of dead and dying grasstrees is a very good indication of the presence of this disease. Aborigines found many uses for this plant, from eating the growing pithy centre or bardi grubs (moth and beetle larvae) from dead plants, to using the resin as a heavy-duty adhesive, especially for tool making. The resin as can be seen above, becomes semi-liquid or highly malleable when heated, but sets rock hard when left to cool. 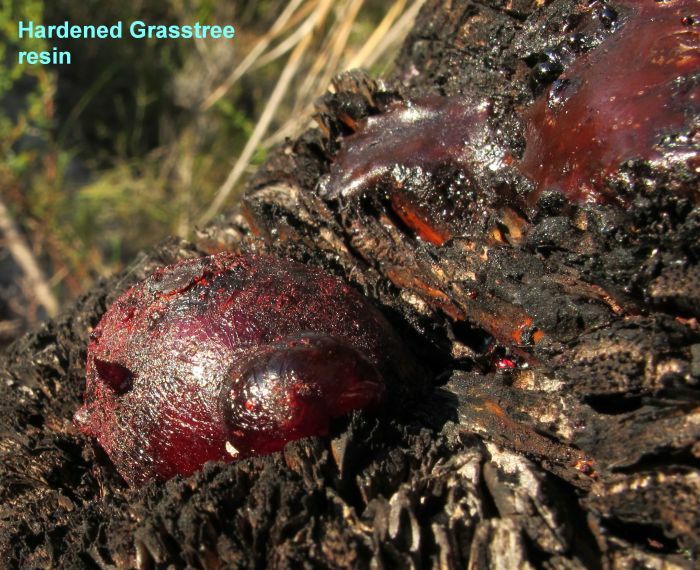 The resin is readily available and can be seen on burnt trunks or as globules on the ground. 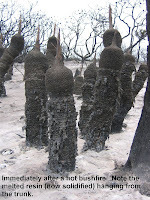 It forms around the base of the leaves to be melted in bushfires, which afterwards will set hard and provide strength and rigidity to the trunk. 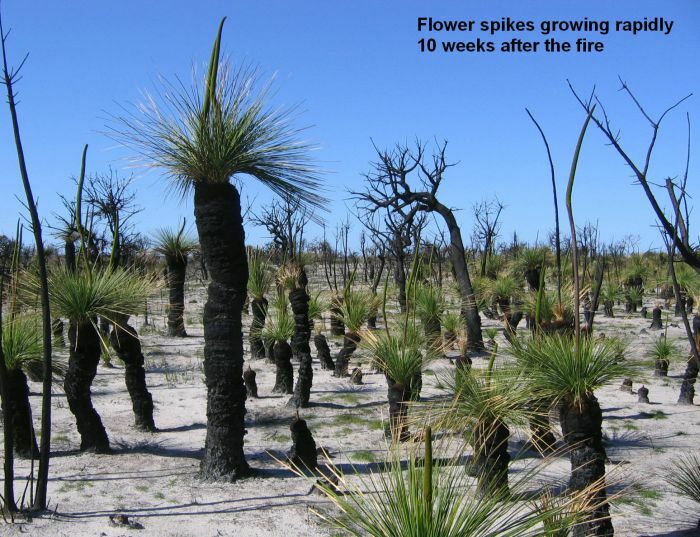 Despite its slow growth between bushfires, it can develop remarkably quickly once one has passed and good rain has fallen. 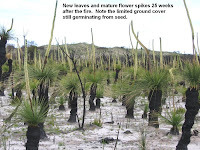 In these circumstances it springs into action with new foliage growth and flower spikes over two metres (6’-7’) in height and all within a matter months, thereby completing its reproductive cycle long before other plants that need to reproduce from seed get past the germination stage. Rarely does Xanthorrhoea platyphylla flower without the influence of fire, but sometimes odd ones will, particularly after a hot summer and/or growing in an open position, but after a fire they mostly all bloom, so around Esperance, flowering can be anytime between June and January.